OYE! 104.8 FM, India’s sabse filmi radio Station awarded its listeners with a golden opportunity to meet the stars of the upcoming bollywood film – Ghanchakkar. 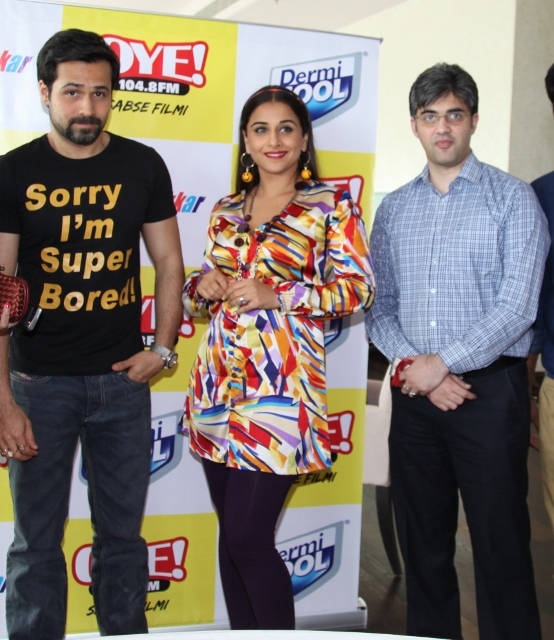 The meet and greet event with Vidya Balan and Emraan Hashmi was organized at a hotel in Gurgaon. The event was organized after an exciting contest “Dilli ke chakkar banaye Ghanchakkar” running on the radio station and its winners were rewarded with a chance to meet the star cast. Following the legacy of its innovative & fun contests, this time too OYE! FM came up with an exciting 16 days contest where listeners were given clues to solve various puzzle related to various roads & landmarks of Delhi. Vidya Balan was giving these clues to the listeners to help them identify the correct answers. As an interesting move, the roads in the puzzles were named after the winners on air. The contest witnessed heavy participation & enthusiasm from the radio station’s listeners. Not only the contest was entertaining but was also educative as it raised awareness about Delhi’s historical places and roads which at times get very confusing to remember. The winners got a rare opportunity to interact with the stars and their favorite radio jockeys. It was a fun interactive session where Vidya charmed the listeners with her witty replies and Emraan got the bells ringing among the female audience. Directed by Rajkumar gupta, Ghanchakkar is a comical romance unveiling in cinemas this Friday, 28th June. This is the second time that Vidya Balan and Emraan Hashmi have come together for a film.